From screen idol to leader of the free world, Ronald Reagan's cool demeanor and commanding presence made him one of the most popular Presidents in American history. When he first took office in 1981,the American people had suffered through years of discontent with the government. By 1989, when he finished his second term, America was once again a proud and confident country with the longest recorded period of peacetime prosperity to date. Meticulously designed, this set of three remarkable coins is a dazzling tribute to the 40th President of the United States. 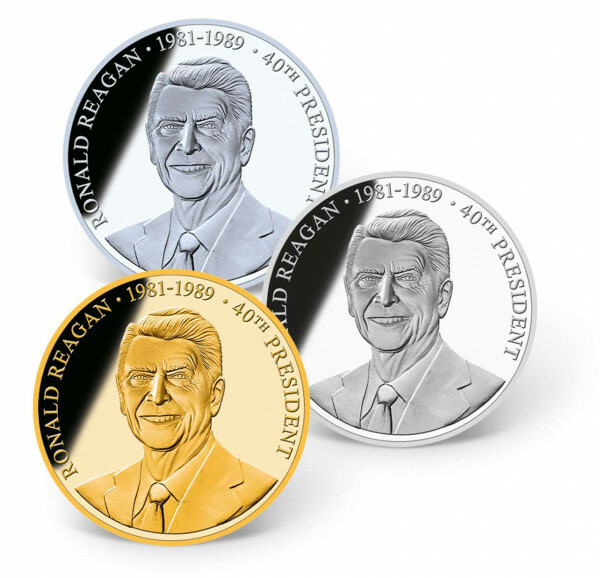 Each coin features a highly detailed engraving of Ronald Reagan on the obverse and is exquisitely layered in a precious metal: one in 24k gold, one in .999 pure silver, and one in pure platinum! These coins are minted to the highest quality "Proof  standard and come in a beautiful wooden collector box, custom-crafted to preserve and display your precious coins for generations to come - a true collector's item.